One example of a meal I eat. 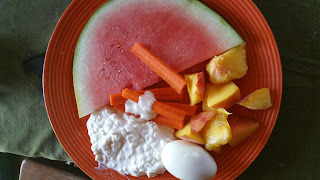 Cottage cheese, carrots, slice of watermelon, and sliced peaches. I eat mainly whole foods that provide simple good nutrition. to diagnose. With Cyclic Vomiting Syndrome, a sufferer experiences extreme bouts of vomiting that last days if not weeks. Usually, a sufferer of CVS will have to go to the Emergency Room to have trained medical personnel help stop the symptoms. A person with CVS will experience this several times per year. In addition to the necessity of medical intervention, the disease itself is still relatively unknown to nurses and doctors. Plus, the disease often gets misdiagnosed. Before I started going to the Emergency Room my symptoms were always cared for by my mother who is a retired nurse. When my symptoms became so bad, I finally began seeking answers to what I thought were extreme stomach flus or food poisoning. At first I was misdiagnosed with celiac disease, until finally I saw a gastroenterologist who said I had CVS. Before either diagnosis I thought I had a weak immune system. It seemed logical to me that I live as healthy lifestyle as I could. For sure I was not perfect. I had plenty of indulgences. For the most part though, I ate organic plant-based foods and was mostly vegetarian or I mainly ate fish as my protein source. I read everything I could on what science defined as a healthy diet. I followed it as best I could. For some reason though, my stomach flus got more frequent. 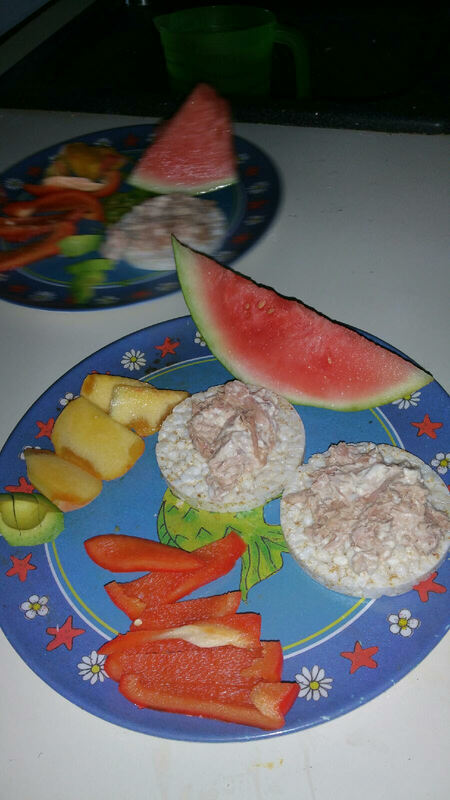 I noticed the more foods like lentils and heavy grained wheat bread I ate the more food got vomited into the toilet. When my daughter was about 6 months old I came down with an episode hours after making a dinner of homemade butternut squash soup and biscuits. Having made everything from scratch, I was able to narrow down what the agitating food might have been, were that the cause of my symptoms the last 30 years. That food happened to be wheat. For the next 24 hours I went off wheat. Almost immediately I noticed changes to my body. Stomach pain I didn’t even realize I had abated. For the next week all I ate were steak and M&Ms. My adult acne disappeared, my stomach continued improving, even my hair felt less greasy and more manageable. Not someone who generally follows trends, overnight I became one of those gluten haters. Months followed no wheat and no sudden CVS symptoms. Still though, occasionally when the norovirus came around I would catch it and my stomach flu sent me to the hospital. I still had cyclical vomiting, although greatly lessened. This continued until my gastroenterologist diagnosed me with a disorder, not a weak immune system. Following a healthy diet, for me, is as easy as pie. Before diagnosis healthy eating was my mantra and I still kept getting sicker. Now I eat a very simple healthy whole foods diet. I eat eggs laid by my chickens with bacon and fruit juice for breakfast. I eat salads without croutons for lunch topped with grilled chicken. I have a small steak with a side of potato and a green vegetable like asparagus for dinner. Milk still bothers my stomach as well as most beans. Wheat is an absolute no. My indulgence: Cheetos. Do I binge. Nope. Do I eat them. Enjoy their crunch. Sure Do. But mainly I focus on eating a well-balanced plant-based diet with about a fist-sized protein per meal like scrambled eggs, chicken breast, or small steak. I also take enzymes that aide in the ATP energy system and the mitochondria like C0-Q10, L-Carnitine, Creatine. My diet is so simple. Eating healthy isn’t a mountain. It’s easy. Anyone can do it. It’s one of those things that looks difficult, but is really a piece of cake. We've been doing elimination diets. Growing up I had tons of vomiting episodes. We thought I always just got a stomach virus. My son seems to have CVS. I'm gluten free vegan. He is vegetarian now moving to vegan because he had an episode after 3 months of being clear (eating way more dairy than normal). I'm wondering, how often do you get episodes now that you found a major trigger (wheat). I'm trying everything I can think of to help him. I feel like a failure when he has an episode though. Any tips? I'm so sorry to hear about your and your son's CVS. I went from having an episode 3 times per year to one in the last three years. My main trigger is wheat although lentils and other beans seem to trigger it as well. I can eat cheese, but high-lactose milk products like milk also affect me. I would like to go back to being a vegetarian, but I don't know how with all my allergies. My biggest reccomendation is co-q10 and L-Carnitine supplements. For you I reccomend taking up running, cycling or other aerobic exercises as aerobic exercise improves the body's mitochondria. Perhaps hiking and you could bring your son along? Or some playing that will strengthen his mitochondria. I do not reccomend medical marajuana simply because it has a side effect called cannibus hyperemisis that is very similar to cvs symptoms. Again I'm sorry you're going through this and if you have any tips on being a vegetarian without wheat or beans I'd love to hear it.